Our Abpromise guarantee covers the use of ab6745 in the following tested applications. 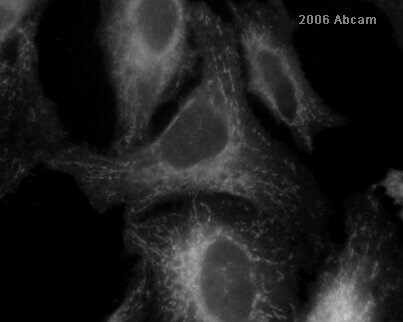 Ab6745 was used at dilution 1/100 with the primary antibody ab30524 in ICC/IF. See the review on ab30524. Publishing research using ab6745? Please let us know so that we can cite the reference in this datasheet. This antibody has not been tested in sheep but is unlikely to cross-react as this polyclonal was raised in this species. The IgG concentration, however, should be in the region of 18.6mg/ml - as this is an IgG fraction, specific IgG will be approximately 10% of this.